Now this beautiful leopard side table is absolutely stunning. Tremendous detail, colour, texture and finishing make this a marvellous item. Looks like the real thing and he is so helpful, holding a slice of trunk above his head for you to put your lamp, drinks and other things on!. Made of resin this has been hand finished and it shows in the authenticity and realistic look and feel of his. Put one in the kids room, or in the conservatory. Would make a lovely gift for anyone you know who is a fan of the quirky items in life. Who doesn’t need a leopard side table in their lives?? Measures 52 x 35 x 32cm. Also available are a cute white polar bear, glossy white teddy bear, pink flamingoes, a black bear, a proud black and yellow penguin black and a gorgeous grey elephant table. Ooh and a Native American Chief! Please do take a look around our on-line store as there are hundreds more wonderful items to be seen. 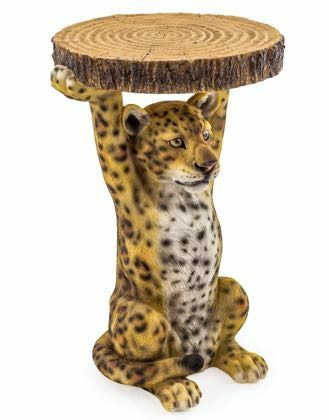 If this Leopard side table is not what you are looking for, we have a lavish selection of gifts, mirrors, French furniture, lamps, chandeliers and vintage style home accessories that will inspire you. Updating a bedroom perhaps? Starting afresh in an exciting new home? Revamping a living room? Or simply adding refreshing feature accents to your home, we are your one stop vintage shop!